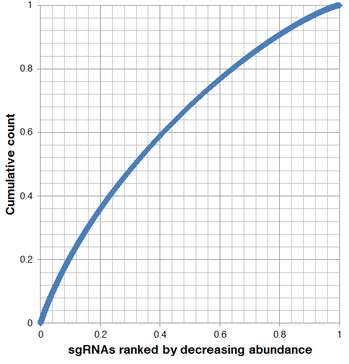 The Sabatini/Lander CRISPR pooled library is a focused gRNA library that targets synthetic lethal candidate and control genes with oncogenic Ras. lentiCRISPR v1- Note: This plasmid has been discontinued, as an updated version is available. For confirmation of screen hits, Addgene encourages users to use the updated lentiCRISPR v2, which can be requested separately. This library will be delivered as a pooled DNA library in a microcentrifuge tube on blue ice. The tube's contents will not necessarily be frozen. For best results, minimize freeze-thaw cycles. When performing sgRNA validation in a Cas9-expressing cell line, the depositing laboratory recommends using plasmid pLenti-sgRNA (Addgene #71049).